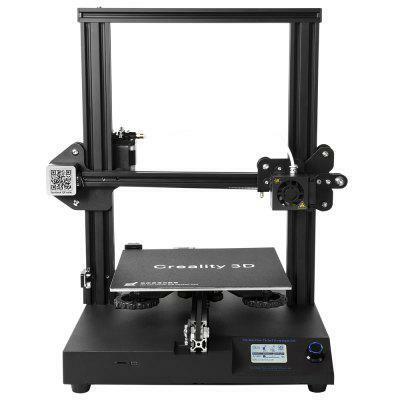 We’re getting spoiled by Creality3D, a 3D printer manufacturer from Shenzen that constantly releases improved DIY kits that are easy to assemble and offer high printing accuracy for cheap. CR20 is the company’s latest creation extending the capabilities of previous devices from this line, offering even more for the same price. Printout precision is simply the best we’ve seen so far in Creality3D devices. Printed models have naturally looking edges and almost invisible transitions between tiny layers no wider than a hair’s breadth. Major improvements were made by using new Creality V2.1 motherboard and improved firmware as well as nozzles that are now made of copper alloy. Compared to its predecessor, CR10 printer, work speed has also been increased without noticeable loss of accuracy. It is somewhat disappointing, however, that the build volume is a bit smaller in comparison to CR10. It is 220 x 220 x 250 cm, so certainly nothing to scoff at, but still you’d need to print bigger projectors in parts. Print resuming after power failure is supported, so you won’t lose your precious filament and work in case of such accident. CR20 uses new type of bed sheet, unusually made not from hard materials like fiberglass or alloys, but build on flexible plastic. This makes it possible to bend the platform, to detach printed model. Unlike the case of rigid platforms, you won’t need to worry about prying models with a spatula or even scraping it with a knife, which often destroys the printout. Smart solution to a common problem that plagues many makers! Just like your typical DIY printer, modular construction requires only tightening six screws and attaching the cables to the appropriate sockets, and you can assembly CR20 in give or take fifteen minutes. It can print offline from a memory card or by using USB connection with configuration available through Open Source Cura software. Unfortunately, there is no auto leveling function here, so before starting work, you’ll need to manually level the hotbed. This done by, first parking the nozzle in the default position (Auto Home), turning off the stepper motor, and then adjusting the height of the plate with four screws underneath. And that’s it: just pick file to print, mount the filament and get it to work. Everyone can do it! In terms of workmanship, this is a pretty standard DIY printer. There is rectangular metal frame, a solid plastic cover that hides mainboard and a monochrome LCD display – all built with the usual garage charm that hobbyists enjoy. The device is quite heavy and weighs 7.5 kg and it has robust power supply with rated power of 270W. It’s resistant to overload and can go on for hours without failure – unlike power supplies in many cheap printers. Creality also provides a 12-month warranty on the printer and a three-month warranty on the nozzle, and a 200 g filament is included in the box, so you can start working on your items immediately. Regardless of whether you‘re an avid hobbyist, newbie or professional using 3D printer at work, CR20 features everything you will need. This is a relatively new printer, so there aren’t many DIY upgrades yet available, but surely Thingiverse and similar portals will publish additional parts for improvements that you can print out yourself soon. It has a smaller build area than its forebearer, but at least it takes up less space on your desk. Great affordable addition to the Creality line of printers!